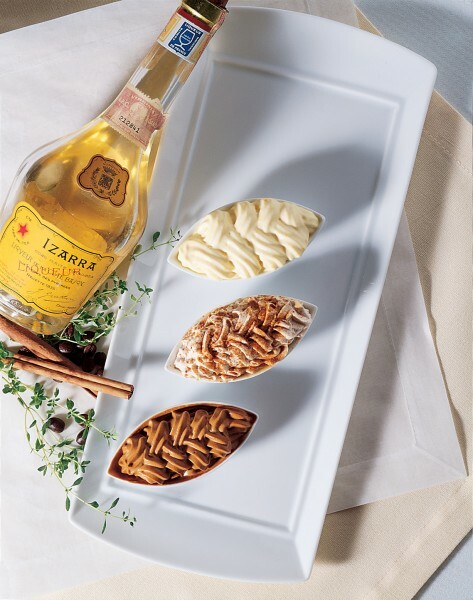 Izarra, the liqueur originating in the Basque area of southwest France, was originally an herbal elixir or tonic used for medicinal purposes. The liqueur is either green or yellow. In this recipe, I have used the saffron-based yellow Izarra. 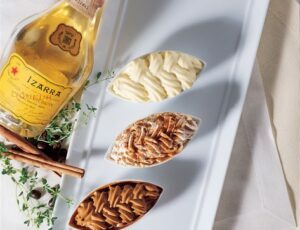 Since Izarra is somewhat difficult to find, I suggest Chartreuse or other herbed liqueurs as substitutes. Whip the heavy cream in a medium mixing bowl and chill. Combine the water and gelatin in a small mixing bowl. Allow 5 minutes for the gelatin to soften. Add the honey and set over a pot of boiling water. Heat for 1-2 minutes until the gelatin melts. Whisk thoroughly. Add the Izarra and mix completely. Fold the Izarra mixture into the heavy whipped cream with the aid of a rubber spatula. Pipe or spoon the mousse into 1/2- cup size or larger stemware or dishes. Top the mousse with a few drops of Izarra, if desired. Hint: The 1/2 cup of Izarra makes for a rather strong mousse. One might begin with a lesser amount and add more to taste.